Hailing from his time in The Big Apple when he was still posting impressive numbers, Eric Lindros would represent the Blueshirts for three seasons (2001-04), with 73 points scored in 71 games during his first year in New York, in 2001-02. 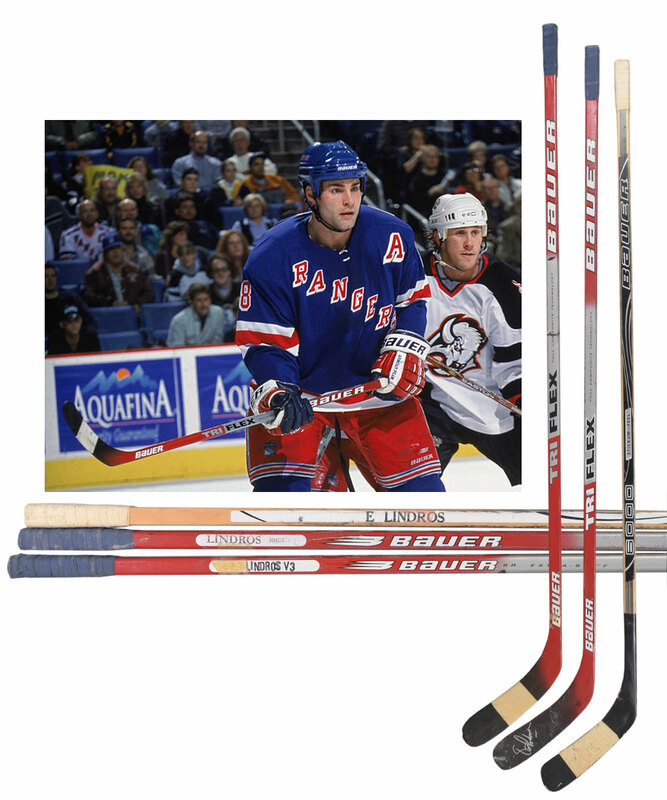 We have a trio of sticks used by The Big E during his time with the Rangers. Included, we have a Bauer 6000 model (circa 2003-04) with “E Lindros” stamped-on, with a factory code along the underside as well as the intact original white tape over the blade and handle. 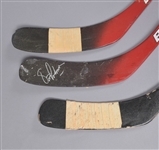 Next, we have a pair of Bauer Tri Flex sticks (circa 2001-03), with “Lindros” over the shafts of each, with a date code on the underside of one stating “26 11 02”. Both sticks feature the original blue cloth wrap over the handles and knobs, with white tape over the blade of one, with the tape removed from the other to facilitate an attractive silver paint pen signature. A signed LOA from Eric Lindros will accompany. The Bauer 6000 model shows nice use with wear to the underside of the blade, while the signed stick exhibits a cracked blade. The remaining Tri Flex stick has a cracked shaft that appears quite weak. We should also note that each stick has some minor tape residue, as the sticks were at one time bundled together.